Scalded Flea ...: Always All In. I am, and have always been 100% in. I have never been one to dip a toe into anything. I'm either engaged or I'm not. So with the whole epilepsy thing? If that is what I am facing, well then I might as well embrace it. Wondering where to start, I contacted Epilepsy Manitoba. They provide access to valuable resources/support groups and if you become a member you can vote. I am going to become a member and who knows, I might even join the Board of Directors (they are looking for new members). They also have a variety of opportunities to get involved, Epilepsy Awareness Day, Golf Tournaments, Purple Pumpkin days (Purple is the signature epilepsy color) to name but a few. I've signed up to volunteer. The way I see it is that I have two choices. 1) Let this diagnosis send me into a pity spiral or 2) Get off my a** and do something about it. Now, granted my volunteering to paint pumpkins purple is not going to change the world, but at least I'm doing something. I choose Option 2. Welcome Back... see what I mean? Sheer lunacy. 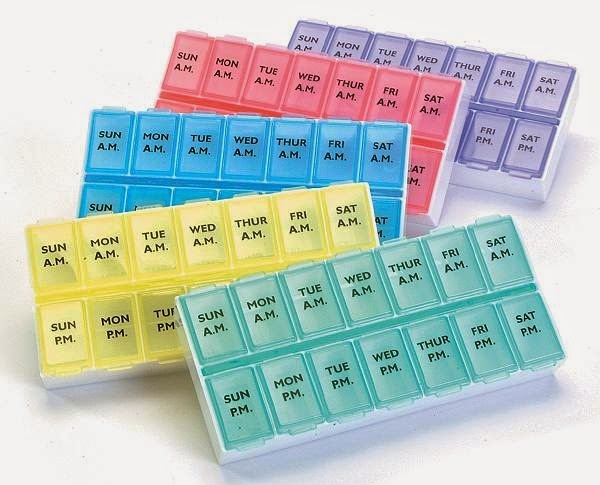 Anyways, as I was about to say before we went on the pink pachyderm tangent, if I am going to have to take meds everyday, then I am going to have a cool pill box. Plus, I know that from time to time I am going to forget if I took a pill or not. So if I portion them out, then I will be able to check. Score one for organization! Wah Wah. Those are far too sterile looking and just... well ... medical looking. I want a container that is going to make me smile at least. It took a bit of searching, because honestly, most of the ones I found online looked like some derivative of the above. Perfect. I love it. 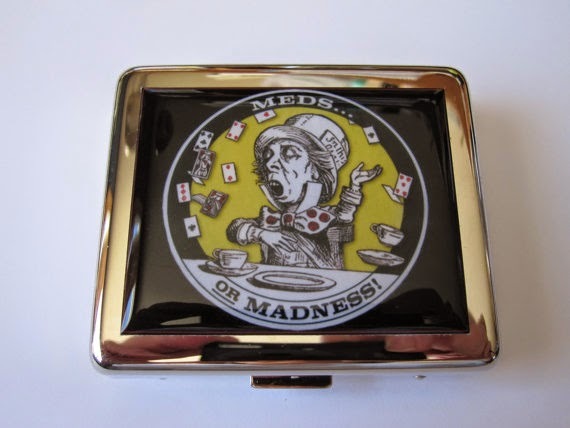 Meds or Madness indeed.